Should you bid on branded keywords even though you are ranking number one organically? Bidding on branded keywords is pretty much considered the norm these days. The topic is widely debated because organic should capture that revenue. We were once sceptical too as it means giving more money to Google but we had to give it a try. We’re always testing assumptions, especially if we can save money for our clients while keeping ROAS and profit in mind. So, should you bid on branded keywords? It’s generally believed that Google Ads results receive 65% of the clicks while organic results only receive 35%. You get the best of both worlds when SEO and PPC show up together in search results as you maximise your search engine real estate and thereby your efforts. 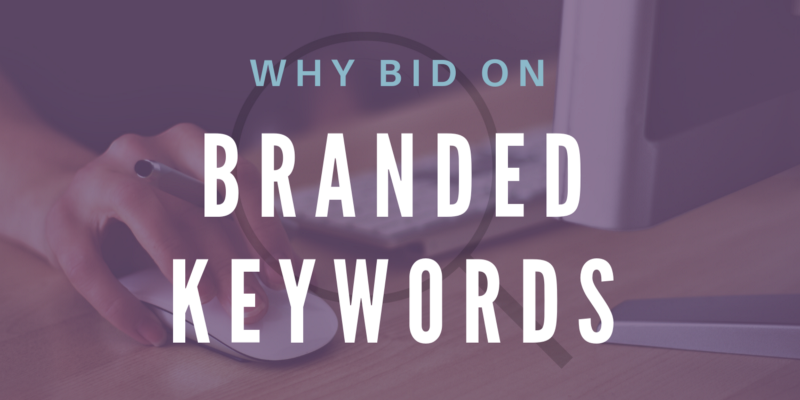 Let’s dive into the five reasons you should in fact bid on branded keywords. Prevent searchers from getting distracted by competing offers. During the research stage of the consumer buying process, the search terms are more likely to revolve around product or service keywords. Once searchers have become aware of what is out there and have made a decision to buy, search queries shift to branded keywords. They already know that you have what they want and are further down the sales funnel than the average person searching for more generic terms. So, you don’t want to miss out on this opportunity to show up at the top when consumers are ready to purchase. Keep in mind that if you don’t show up at the top during this ‘moment of truth’, a competitor will and distract them with a shiny offer. Bidding on branded keywords helps you to maximise search engine real estate and keep competitors at bay. According to a respectable source, having a paid ad alongside an organic listing has proved to increase clicks by 32%. This boosts click-through rate (CTR) as the searcher is presented with more opportunities to click in a way that benefits you. This double team effect certainly solidifies your brand in the minds of your target audience and chases competitors away. Branded search terms are cheap as chips. Cheap keywords with big search volume, higher CTRs and great quality scores. What’s not to love? Generally speaking, bidding on branded keywords is less expensive than bidding on generic keywords which helps you get the most value out of your budget. You control your messaging and traffic direction. With regards to organic search, Google can change the meta description of the page from what you originally set without your permission. Paid search ads allow you the opportunity to put together very specific messages that will entice your searchers and lead them to your most valuable landing pages. Instead of sending searchers directly to your home page with organic listings, you can choose where they end up. These visitors are way more likely to convert than those left to explore the website on their own. Google Ads (formerly AdWords) gives you the ability to use various types of ad extensions which boost engagement. Location, call and site link extensions not only make it easier for users to access specific information about your business but it also takes up more space in the search listings. This gives you a bigger chance of getting their attention as your PPC ad will be more prominent than other listings. Improve account health (quality scores). A good quality score is affected by your CTR, relevancy of each keyword to the ad group, landing page quality and relevance, relevancy of ad text. Branded terms will have higher CTRs because a searcher is looking for you specifically and of course, this will boost your quality score over a competitor bidding on your brand. Once your quality scores are good, you will mostly outbid any of your competitors leading to an overall improvement of account health. Of course, there are many more reasons to bid on branded keywords but taking these five reasons into consideration, it should be a no-brainer to adopt this strategy. Keep in mind that your digital marketing strategy will always perform its best when SEO and PPC are working together as a team. Do you need an experienced team to guide and manage your Digital Marketing efforts? Feel free to get in touch with us on 0117 908 6666 or email [email protected] to find out how we can help you.